I have missed hand quilting SO much! I didn’t realize it until this weekend, when I spent some time stitching on my “Circles” quilt. Last night was perfect. It was cold and rainy outside, the wind was blowing hard, and I was snuggled under this quilt, just a stitching away. Perfect! 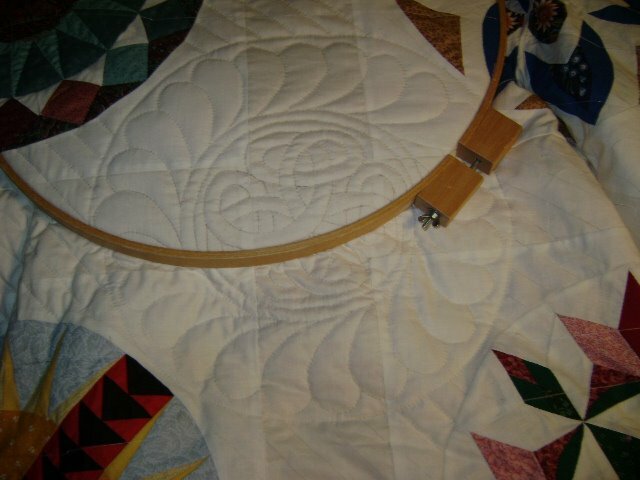 Even though I bought a machine and frame for machine quilting this past summer, I will always continue hand quilting. I find it so relaxing and peaceful. I used to quilt on a frame that my husband made, but I find sitting in a comfy chair with a quilting hoop works better as I’m aging. It doesn’t hurt my neck and back so much, and it’s more portable. Just Jen at Quiddity Quilts posted in response to my article about storing stash. OK, Jen and Amanda Jean, you are welcome to come to my house and fix my stash. I’m in stash envy. I probably have more than you do, but I like how yours looks. Are you a hand quilter or machine quilter? hi caron……as you know from my blog i have been hand quilting too….i LOVE it…i have found that if i’m quilting something besides a straight line, a hoop works best……i just love the dip and dot effect hand quilting gives……! Your quilting looks great! 😎I enjoy the hand-quilting (click on my sidebar whole-cloth to that post), and am still in the learning stages of machine quilting, which, I admit, gets a job done faster if it IS something that has to get done and gone! I have a quilt that has been waiting for more hand-quilting, but I was not told that the pattern should be drawn on BEFORE it is sandwiched, so I am somewhat at a stand still loss…any suggestions? Hand quilter, all the way. I get very tense trying to machine quilt on a home machine. No matter what tricks I’ve tried (music, remembering to breathe and such), there is something about hand quilting that can’t be beat. I can let my mind do its own thing, listen to audiobooks, plan the next quilt or just relax and listen to the needle pop in and out.